Wednesday is Halloween. 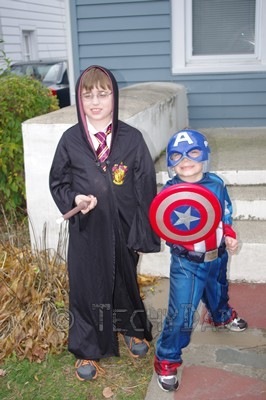 However, thanks to Hurricane Sandy, going Trick or Treating is the last thing on many people’s minds. We knew that Wednesday was likely going to be a washout here. Of course, if that’s Sandy’s only legacy by us, we’ll count ourselves lucky. On Sunday, the sky was cloudy, but there was no rain. It was a perfect time for the boys to a) be outside (something they won’t get to do for the next couple of days) and b) try out their costumes. JSL had decided he wanted to be Buzz Lightyear. Unfortunately, all of the Buzz costumes were for little kids and didn’t fit him. 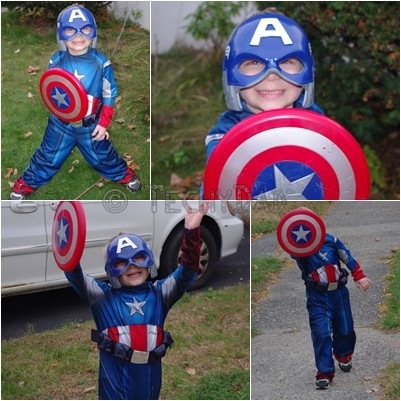 After Buzz, he couldn’t decide on Indiana Jones or Captain America. In the end, Captain America prevailed. NHL chose Harry Potter, of course. We’re in the middle of reading the books and he’s in love with the entire series. When he needed glasses, back in March, he even picked a frame out because it looked like Harry’s. 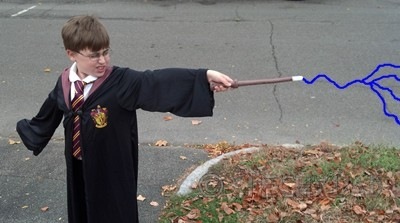 NHL loves casting spells with his wand, even if he wasn’t quite character-accurate with the magic he was doing. 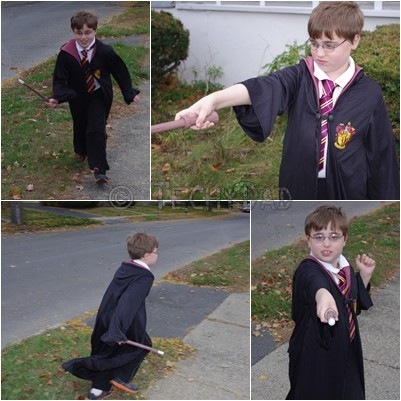 Hint: Harry Potter does not tend to use Unforgiveable Curses like Cruciatus or Avada Kedavra. The kids had a blast playing in their costumes. We don’t know what the next few days will bring. Hopefully, we’ll escape this hurricane with minimal damage. At least the boys were able to have some fun before Sandy struck.